← Adobe Reader or Acrobat displays a "At least one signature has problems" message when signed PDF is opened. Signature validity is UNKNOWN. Signer's identity is unknown. How to tell if a Signature is valid or not? I have a process/workflow, at the end of the workflow, it saves the PDF form in the ContentSpace. The form has Signature fields. Server is LiveCycle ES 2.5, Turnkey. Windows/JBoss/MySQL. Client computer has the latest Acrobat Reader X (10.0). it says everything is valid. that says: At least one Signature has problems. How to tell which one is correct? First off, if you see a green check mark, the signature is valid. The behavior you are experiencing is due to the configuration (or misconfiguration) of the "Trusted Identities" in Reader. For a signature to show a green check mark, the signer must be valid, and the signer must be trusted. 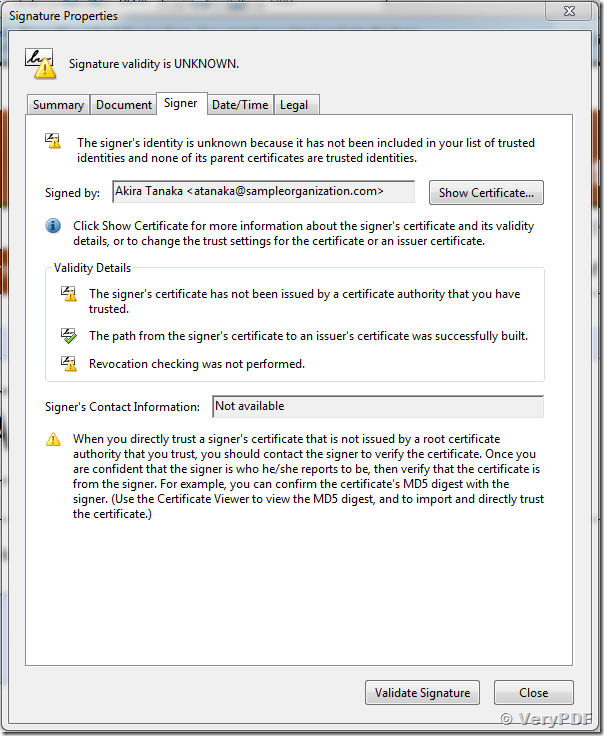 For Acrobat or Reader to "trust" a signers certificate you need to configure a "trusted identity" by importing the signers public key. Select "Validate Signature" - you should now get the green check mark. 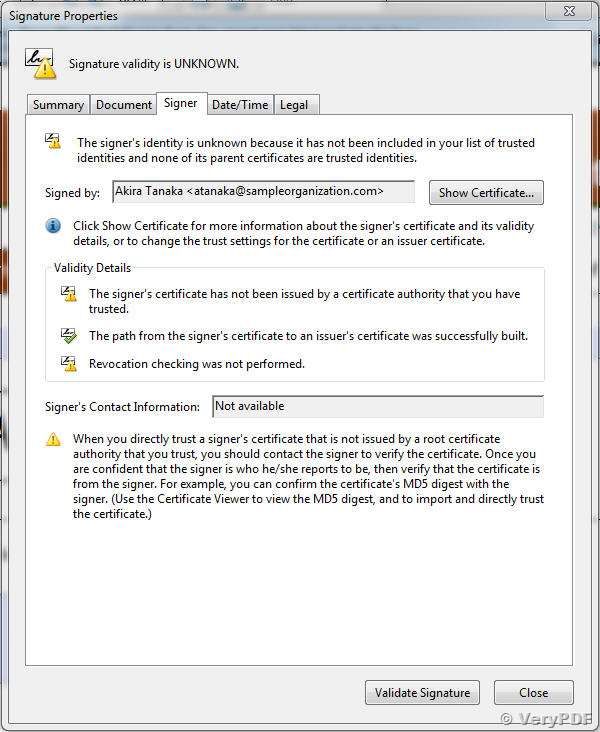 Trusted identities in Acrobat\Reader are tied to the Windows account profile, this explains why when logged onto the system as user1, the signature shows a green check mark (the trusted identity is configured), and when logged onto the system as user2, the signature shows a a different status, because the signers certificate has not been trusted under this profile. If you were to look at the details about the signature (in the signatures pane) you will see that is will say the signature is trusted, but the signer is unknown (not trusted). Yes it worked just like what you described. Do I have to do this for each and every .pdf file? You can use the Acrobat to create a "security settings” file that contains all the trusted identities, place it on a server and then set the preferences of Reader\Acrobat 9.x or 10 to download the file, thereby automatically configuring security, including trusted identities. (see screen shots). Thank again for quick response. Appreciate it very much! I have created a "security settings" file according to the instructions above, placed it on a server, and set Reader preferences to download the file. I still receive the "Singer's Identity Unknown' message when hovering over a signature field. Does the URL for the Server Setting need to be formatted in a particular manner? I've tried every variation that I can think of. 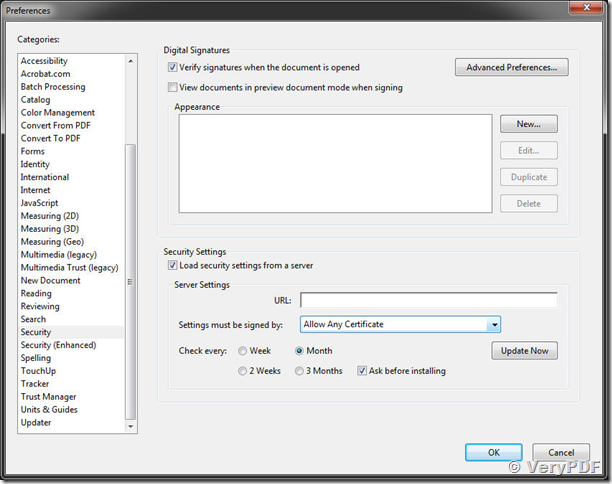 Was the security settings file created from a system where the signature showed signer's identity correctly? Did you include the "Trust Settings" and "Signature Validation Settings" in your security settings file? Have you validated if the "Trusted Identities" on the system that you imported the security settings is configured to trust the signer of the document? By the way, this question should really be a new post as it is a different topic that this thread originally started as. I'll present my question in a new post and I'll provide the information that you requested in your reply. Are any certs built-in trusted by Reader? Does adobe have built-in trust? I'm getting this error on a lower level certificate that has been signed by a verisign top-level cert. Just wondering whether I NEED to add trust, or whether trust for the major players is already built in. You will need to configure the trust for any root certificates issued by certificate authorities where the credentials were used to simply sign the document. 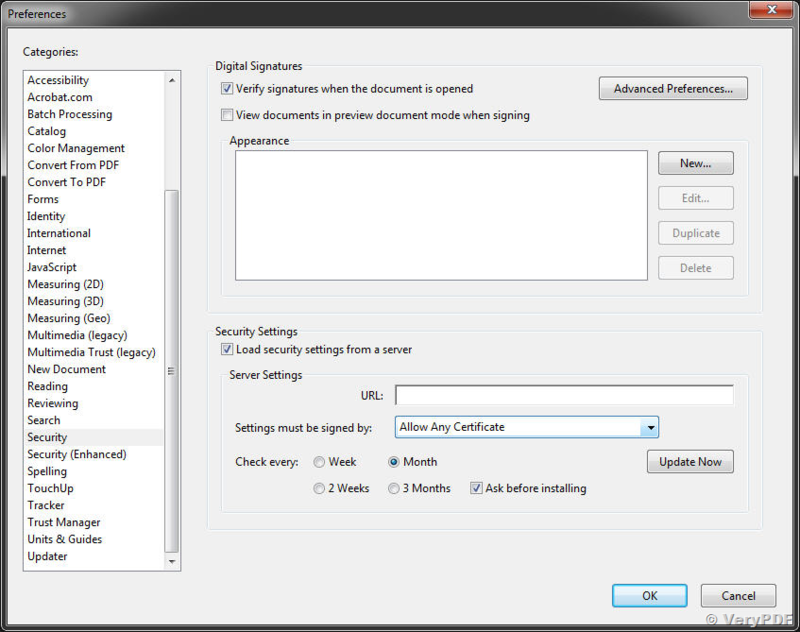 Adobe Reader or Acrobat displays a "At least one signature has problems" message when signed PDF is opened. Signature validity is UNKNOWN. Signer’s identity is unknown. This entry was posted in PDF Security and tagged pdf signature. Bookmark the permalink.